Ruffian was undoubtedly the greatest filly to ever set foot on the American turf. Born and raised at the famous Claiborne Farm in Paris, Kentucky, the near black filly carried the blue blood of champions in her veins. She had an insatiable desire to win but in a tragic turn of events Ruffian’s competitive spirit ended up costing the filly her life. As a two year old in 1974, Ruffian made her presence known by winning her first race by 15 lengths in track record time. In every race she ran, Ruffian led her competitors from the staring gates to the finish line. She set stakes records in each of the eight stakes races she won and set two track records. Ruffian won the Sorority Stakes with a freshly popped splint. A ‘popped splint’ can be either inflammation of the ligament that runs between the cannon (shin) bone and a smaller bone known as the splint bone or it can be a small fracture of the splint bone itself. While a popped splint is a minor injury, it can be very painful and impedes a horse’s performance. Ruffian set a stakes record despite the injury she suffered during the race. In another record setting performance, Ruffian suffered a hairline fracture to a hind leg on her way to victory. It seemed that nothing could slow the champion filly down, but the mounting injuries were beginning to take a toll on her body. Horses are large animals but many of the bones in their body are extremely fragile. In 1974, Ruffian was named Champion Two-Year-Old Filly and the following year she won the Triple Tiara and was crowned Champion Three-Year-Old Filly. The Triple Tiara, also known as the Triple Crown for fillies, then consisted of the Acorn Stakes, Mother Goose Stakes and the Coaching Club American Oaks. There is nothing “fun” about this EZ Horse Betting fact. Horseracing involves risk to the horse and rider. Many horses and jockeys have given their lives on the racetrack. You can watch Ruffian’s final race and interviews with trainer Frank Whitely, Jr. and jockey Jacinto Vasquez here. Ruffian’s final race was a highly publicized match race against 1975 Kentucky Derby winner Foolish Pleasure held at Belmont Park on July 6, 1975. Jacinto Vasquez was the regular rider for both Ruffian and Foolish Pleasure. He chose to ride the filly against the colt. Just 3/8 of a mile into the race as Ruffian began to pull ahead of her foe, the unthinkable happened. Both riders heard a loud cracking sound as bones in Ruffian’s right front leg snapped. Despite this horrific injury, Ruffian refused to quit running. Vasquez tried as hard as he could to stop her. She continued fighting her rider in order to run on, pulverizing her bones and ripping the skin from her ankle. Ruffian’s ligaments were torn and her hoof dangled by the skin that remained. Ruffian was rushed to an equine hospital and underwent emergency surgery. As the anesthesia started to wear off, Ruffian began thrashing wildly on the floor of the padded recovery room as if she were still running the race. Despite the efforts of numerous attendants, Ruffian spun in circles on the floor. While she flailed about she broke her other leg and dislodged the cast, doing further damage to the initial injury. 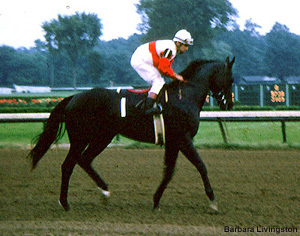 The decision was made at 2:00 am on July 7, 1975 to humanely euthanize the mighty Ruffian. She is buried in the infield at Belmont Park with her nose facing the finish line. All of the stakes records set by Ruffian except one remain unbroken to this day. Trainer Frank Whitely, Jr. kept Ruffian’s stall empty throughout the remainder of his career. Forego – One of the Greatest Handicap Horses of all Time.